Vision techniques and their application in video-mediated communication offer a number of interesting research opportunities. Issues around eye contact, field of view and line of sight all become even more pressing when designing for medium to long-term deployment. James Norris is doing a PhD with me and Qiu Guoping on this subject. Discover the Nottingham you didn't know on a guided tour where you are the guide. Unlock unknown spaces and overhear stories these spaces tell. Anywhere Somewhere Everywhere was an interactive conversation with new technology from fingerprint to footprint – between the visitor and the visited, past and present, private and public. It allowed participants to explore an urban area, tying together information not normally available, new points of views and interaction embedded into physical places. Guided by ‘unseen’, on-the-street performers in an ongoing conversation maintained over mobile phones, they gained access to locative media and staged performances. 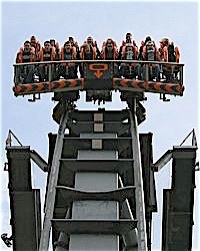 In a follow-on project to Fairground Thrill Laboratory, Brendan Walker and the Mixed Reality Lab collaborated to bring Thrill Laboratory to Alton Tower's Oblivion, the world's first vertical drop roller coaster. Equator and Healthsmart are supporting Brendan Walker, the curator of Fairground: Thrill Laboratory, at the Dana Centre of the Science Museum, London in his exploration of the nature of Thrill. 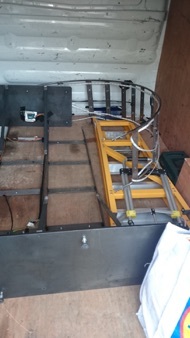 Body mounted telemetry equipment is used to allow an audience to participate in the experiences of riders on a fairground ride. Ceated in collaboration of Willi Dorner, The Mixed Reality Lab and the Architecture Department. 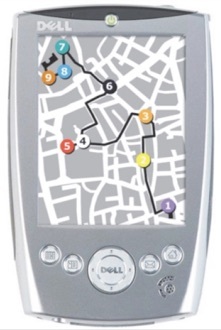 A PDA based tour of Sneinton Market, Nottingham, UK, using a novel 'follow-the-video' navigation interface. Mixed Reality Architecture (MRA) dynamically links and overlays physical and virtual 3 dimensional spaces. 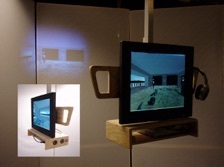 This project at the Bartlett School of Architecture and the MRL in Nottingham investigates the topology of and the relationships between the components of MRA from an architectural perspective on Mixed Reality. As a phenomenon, MRA takes its place in a long history of technologies that have influenced conditions for social interaction as well as the environment we build around us. However, by providing a flexible spatial topology spanning physical and virtual environments it presents new opportunities for social interaction across electronic media. An experimental MRA allowed us to study some of the emerging issues in this field. It provided material for the development of a framework describing virtual and physical spaces, the links between those and the types of mixed reality structure that we can envisage it being possible to design using these elements. Following this initial work, a re-developed MRA has been deployed in six different offices at three academic institutions in the UK and studied long-term. It has proven effective in providing its inhabitants with informal but also focussed opportunities for contact with remote colleagues. Through its virtual 3D nature and its embededness into physical buildings, contacts made are visible and accountable to others. It can be said to integrate well with exisiting building structures and work practices that are to be found there. MRA has now been used for more than two years with a changing population and across different physical offices. Created in a collaboration between the Architecture School at Nottingham and the Mixed Reality Lab, this guided walk explores the projects of graduate Architecture students in the centre of Nottingham with the help of a Flash based PDA interface. Part of Architecture week 2003. A new Architecture Centre for Nottingham combining physical administration and meeting facilities with a 3D virtual online exhibition space, accessible from dedicated interfaces onsite and online. The public space around the physical building transforms into a shareable interface to the online 3D space with images projected on the covering canopy. The 3D virtual space adapts to differen uses (design space, exhibition, lecture theatre) and to different users, by making different parts of the space available. A novel type of Adaptive Architecture drawing on personal data directly derived from people’s physiology. ExoBuilding explores the novel design space that emerges when an individual’s physiological data and the fabric of building architecture are linked. In its current form ExoBuilding is a tent-like structure that externalises a person’s physiological data in an immersive and visceral way. 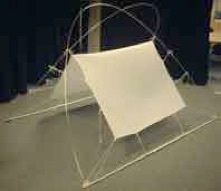 This is achieved by mapping abdominal breathing to its shape and size, displaying heart beat through sound and light effects and mapping electro dermal activity to a projection on the tent fabric. 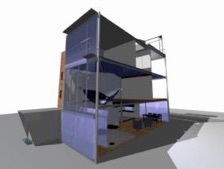 Adaptive Architecture represents an expansive, multi-disciplinary and exciting research field, but despite delivering clear benefits and novel types of architecture, individual inhabitants often find adaptive buildings counter-intuitive, illegible and frustrating, an issue most clearly seen in the extensively researched smart homes sector. In addition, organisations (as inhabitants) often find Adaptive Architecture difficult to operate, to maintain and to keep relevant to their needs over the life-span of a building. To discuss the challenges that are faced in this regard, this workshop will focus on inhabitants (individuals, groups & organisations) of Adaptive Architecture, as the key drivers of adaptations and as those who are directly affected by adaptations. The Creativity Greenhouse project funded by EPSRC investigated whether facilitated creativity activities (e.g. funding sandpits, bridging the gaps events, group brainstorms) can be conducted with participants remote to each other, supported by digital communication technologies. Use of such technologies could enable the capability to work without geographical and/or time constraints and could enhance the pool of people involved in contributing to meetings and generating ideas. Use of technology could also support more efficient and cost-effective ways of working, e.g. resulting in significant savings on meeting costs. 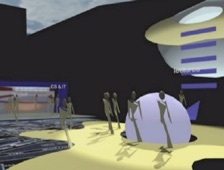 Following a collaborative pilot of the Creativity Greenhouse approach, run by the Horizon Digital Economy Hub and EPSRC, the aim of this project is to develop the existing approach (consisting of event structure, technology set-up and evaluation method arrived at during the pilot project) to a stage where it can be used more widely across EPSRC and beyond. This project brings together University College London, the University of Nottingham (Mixed Reality Lab, Computer Science), the London Borough of Waltham Forest, the Commission for Architecture and the Built Environment (CABE) and Leytonstone Business Improvement District (e11bid) to investigate how the urban experience mediated through connected large screens can be designed to augment real world interactions, support communities, and promote and develop culture so as to maximise the quality of the public experience within the urban realm.Through an iterative prototyping methodology we will integrate the content development, placement, local interactivity and distributed connectivity of four re-locatable screen nodes connecting Nottingham with London. 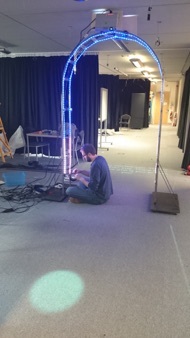 This set-up will allow us to explore remote connectivity by comparing two with three and four networked nodes, creating situations and experiences that differ in their urban settings and the types of populations they support through different seasons. 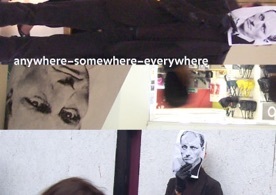 We will develop the screen content (such as applications and experience) and evaluate mediated public interactions around these screens by engaging with the London Borough of Waltham Forest, the local communities around all four nodes locations, and commissioned artists in definition of the research challenges as well as in the programme of research itself. The University of Nottingham EPSRC Impact Accelerator Account and the Hermes fellowship programme is funding the network for this period to explore it’s use in academic outreach and to develop a business model around the technology. Digital technology has taken hold in Architecture. As a result, buildings are becoming adaptive to data sources taken from the environment, from inhabitants and from objects present within buildings. The role of personal data in this context is particularly challenging. What might a building know about its inhabitants? 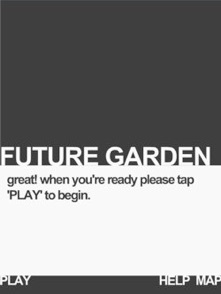 What kind of information might be mutually useful to building performance and inhabitants? What kind of relationship might result from buildings having access to some of our most intimate data? Physiological data is one particular stream of personal data. Physiological data here refers to data such as heart rate, respiration and brain activity that can be measured, manipulated and to some extent be interpreted to say something about the inhabitants' emotional and mental state. Linking physiological data to the building fabric opens up entirely new potentials in Adaptive Architecture. 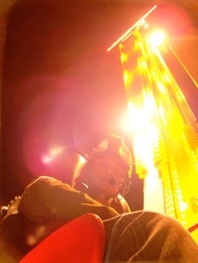 An initial exploration has been done in the ExoBuilding prototype. There are many more possibilities ... some of which are explored here. MOVE is an architectural prototype and research platform to explore the relationship of body movements and movements in adaptive architecture. Using a Kinect motion sensor, MOVE tracks the gross body movements of a person and allows the flexible mapping of those to the movement of building components. In this way, a person inside MOVE can immediately explore the creation of spatial configurations around them as they are created through the body. 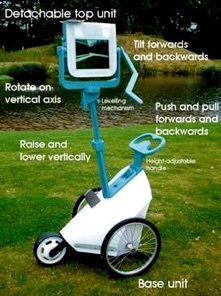 This can be done live, by recording body movements and replaying them and through manual choreography of building elements. Trial feedback has shaped our four-stage iterative design and development process. 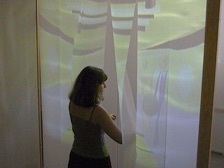 The video shows Tetsudo performers Hamish Elliott and Natalie Heaton exploring interaction with MOVE. 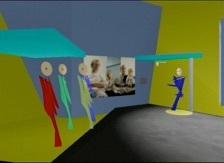 MOVE was created at the Mixed Reality Lab, School of Computer Science, The University of Nottingham by Holger Schnädelbach and Hendro Arieyanto in 2014. Developing the strategies, mechanisms and applications, which allow people to interact with personal data through the built environment. 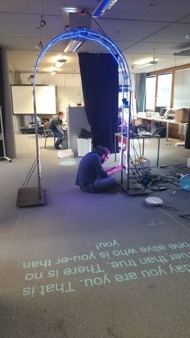 This research project investigates that role of the built environment in our interaction with personal data. There is particular emphasis on the feedback loops that are created when architectural adaptation is linked to personal data and on the role of the built environment in the path of personal data becoming big data to be stored, mined and re-used. 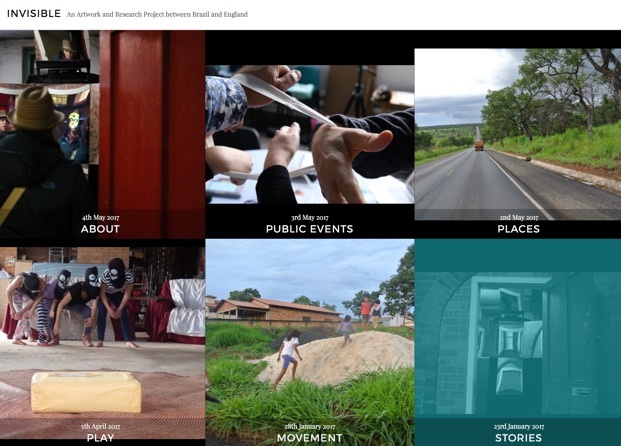 The project will be driven by prototyping framed by fieldwork and theoretical enquiry in collaboration with internal and external partners. Adaptive Architecture is concerned with buildings that are designed to adapt to their environment and to their inhabitants whether this is automatically or through human intervention. This is a multi-disciplinary research interest spanning Architecture, Computing, Engineering, Design, Psychology and the Social Sciences. 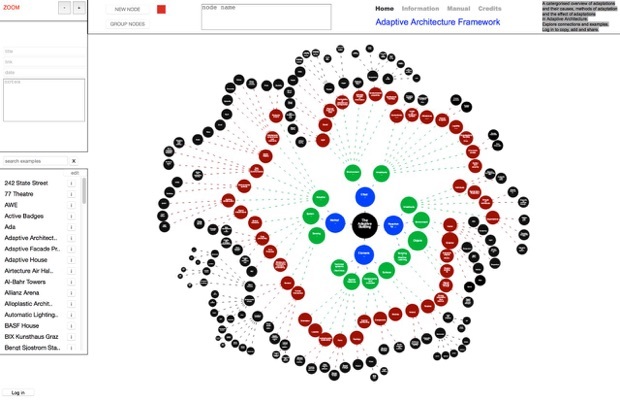 The Adaptive Architecture framework captures the developing field and allows the crowd-sourcing of changes, adaptations and additions. It provides a categorised overview of adaptations and their causes, methods of adaptation and the effect of adaptations in Adaptive Architecture. It is useful for researchers and practitioners in this area. 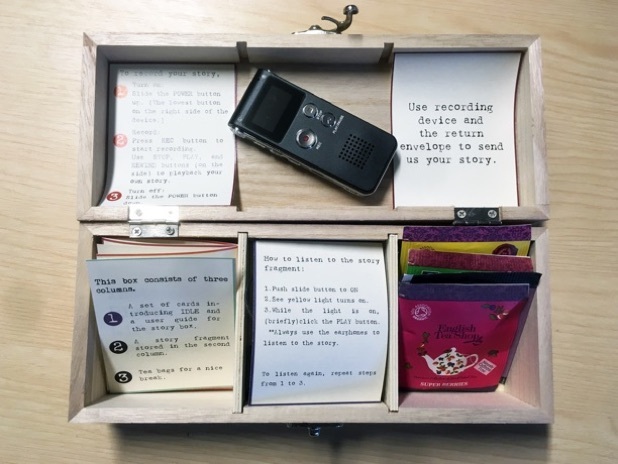 The Data Journey Archway explores personal journeys, sensing in urban places, public engagement and personal data. 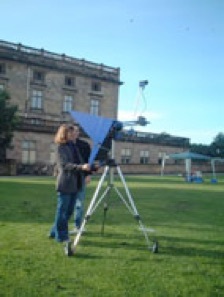 It was exhibited first at Light Night 2016 at Nottingham, attracting hundreds of people to try it out. 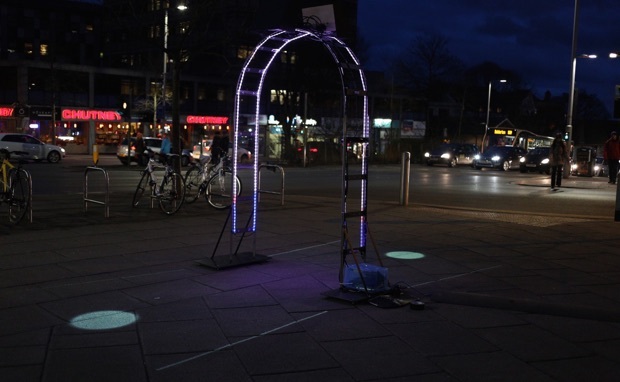 The archway reacted to people passing through, measured people’s height, clothing, company and attitude and projected this information into public space, alongside a personal question and answer. The Data Journeys Archway is a collaboration between artist Andrew Wilson and the Mixed Reality Lab / Horizon and the first outcome of Andrew’s residency at the lab and with Sustrans. 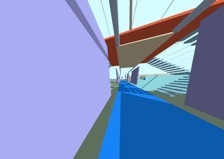 In collaboration with Nottingham-based Tom Dale Dance Company, the Mixed Reality Lab / Horizon developed the Digitopia app. The Digitopia app connects the show on stage with the activities in the foyer before and after the show. It is aimed at an audience between 5 and 10 years old. 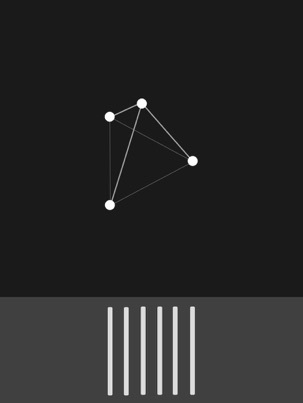 By creating simple geometrical shapes on tablet screens, children construct a soundtrack, both inspired by geometry and sound present on stage. 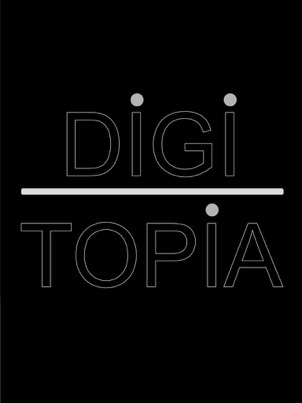 Digitopia and the Digitopia app premiered at Lake Side Arts centre on the 12 February 2016 and is touring the UK until April 2016. 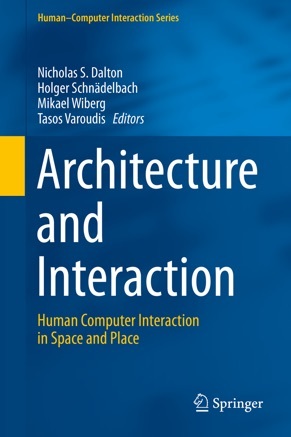 Architecture and Interaction is aimed at researchers and practitioners in the field of computing who want to gain a greater insight into the challenges of creating technologies in the built environment and those from the architectural and urban design disciplines who wish to incorporate digital information technologies in future buildings. Ubiquitous computing has a vision of information and interaction being embedded in the world around us; this forms the basis of this book. Built environments are subjects of design and architects have seen digital elements incorporated into the fabric of buildings as a way of creating environments that meet the dynamic challenges of future habitation. Methods for prototyping interactive buildings are discussed and the theoretical overlaps between both domains are explored. Topics like the role of space and technology within the workplace as well as the role of embodiment in understanding how buildings and technology can influence action are discussed, as well as investigating the creation of place with new methodologies to investigate the occupation of buildings and how they can be used to understand spatial technologies. --- Call for participation: As part of the Nottingham Research Fellowship ‘The Built Environment as Interface to Personal Data’, this workshop will bring together researchers and practitioners to discuss the relationship of People, Personal Data and the Built Environment. --- Personal data, data that allows a person to be identified, is increasingly important in our lives. We voluntarily give it away to organisations for a perceived benefit, for example in our use of social media. We use personal data to quantify our behaviour, as in the many sports and health apps or for 'personal branding' through sites like LinkedIn and Facebook. We are also forced to pass with our personal data to access certain services, for example government services or transport networks. The built environment plays a key role in this current, still developing use of personal data, even though this remains relatively hidden. Buildings are the locations for the technical infrastructure that captures personal data, such as oyster card gateways or wifi hotspots. Personal data is used to adapt buildings to people's behaviour, for example when a card reader opens a door or occupancy changes the light levels in a building. Organisations that manage buildings depend on records of personal data to understand how buildings are occupied and how communities develop. Personal data also plays a role during the design process, when architects record the requirements of their clients, and this might become encoded in Building Information Modelling. This workshop brings together different stakeholders who work with people in the built environment in the broadest sense. The aim is to discuss what role personal data plays in people's interaction with the built environment. Expenses: UK Travel expenses can be covered. Attendance is free. Please register your interest: holger.schnadelbach@nottingham.ac.uk briefly stating your current involvement with the topic and what you would like to take away from the workshop. The Data Journeys Archway is returning to public space, this time to the foyer of the Exchange building on Jubilee Campus. Experience it there from 14th February until 17th February. When you stand in front of the archway a question will be projected onto the ground. It will be a question for you to ask yourself. Step through the arch and it will learn something about you and give you a piece of wisdom in return. 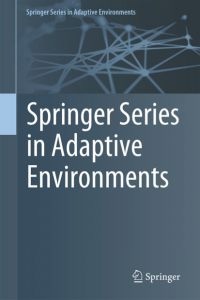 The Springer Series in Adaptive Environments presents cutting-edge research around spatial constructs and systems that are specifically designed to be adaptive to their surroundings and to their inhabitants. The creation and understanding of such adaptive Environments spans the expertise of multiple disciplines, from architecture to design, from materials to urban research, from wearable technologies to robotics, from data mining to machine learning and from sociology to psychology. We welcome your proposal for monographs and edited volumes. Further details available on the series page. Two mirrors, on either side of the Atlantic, are being designed to reflect the environment where they are located, with an invitation to play, perform and explore our sense of place and where we feel we are from. IDLE was created in 2016 to address the increasing ephemerality of digital culture. Digital technologies allow us to create and share content across the globe more easily than ever before, but that culture is at risk of being lost for future generations. Follow us in our important archiving work, looking to rebuild the global storytelling archive following the 2020 solar flare. Work with Liz Evans and Hyosun Kwon, funded by the University of Nottingham.